Our theme this month is Spring Cleaning: use something from your stash. If you arrived here from Jen's Blog then you are in the right place. 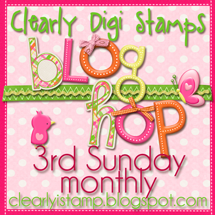 If not, you may want to go back to the Clearly iStamp Blog so that you don't miss any stops on the hop. Each of us participating in the hop gets to pick one lucky random commenter to win the digital stamp set that we used today. So you have a chance to win at every blog instead of just one winner. But you only have a chance if you leave a comment. So, don't forget to comment! From my stash I used the Green at Heart designer paper from Basic Grey and those bright fuschia flowers from Prima. And of course I have a big ole glass bowl full of buttons that I've collected over the years. Supplies: DCWV cardstock; Basic Grey Green at Heart Designer Paper; Spellbinders Lacy Circles; Prima Flowers; Butterfly Bunny Digital Stamp Set by Clearly Digi Stamps. 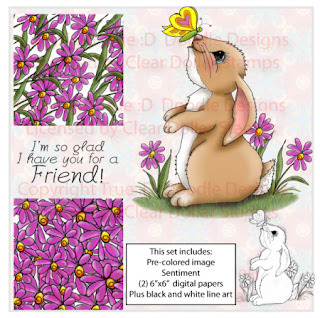 This set comes with a friendship sentiment but with this cute little bunny you could make some darling Easter cards. Like it? Leave me a comment for your chance to win it. Make sure you leave an email address in your comment if you are interested in the prize. Deadline to comment is Wed, March 20th at 3pm EST. Your next stop on the hop is the talented Cassie. What a beautiful purple card! Love the DP you've used, and those flowers with green buttons are really decorative and go so well with the image! Jennipher this is one of my Favorite Digital image sets from Clear Dollar stamps. Great card, layout, DP. Fantastic Inspiration! That bunny is adorable! And I like how your Prima flowers look like you picked the ones right off of the image. Lovely! This bunny is just adorable! Gorgeous card Jennipher. HI Jennipher - what a lovely spelling on you name! ! Beautiful bunny card creation! I love this set and I would be blessed to win it as well - Thanks for sharing your lovely creation with us and have a wonderful Sunday. Thanks for the hop and for an opportunity to win a prize as well - enjoy your Sunday! Beautiful, sweet image and flowers Jennipher! What a CUTE digital bunny and your card is wonderful. Love those big flowers. What a precious bunny image! I love this bright color you chose - it's beautiful and so festive looking! Darling card!Such a wonderful set. Love the bunny and digital paper. Great embellishments and my favorite color. Thanks for the fun hop! beautiful colors!!! super cute immie too!! great job jen!!! Adorable bunny image!! Love all your vibrant colors & coloring!! That's adorable Jennipher how you used that cute bunny. Hi Jennipher. So happy to see that you are with the gals at CDS. I hope that your family issues are going better for you and that your Mom is doing better. Sad though that I am not working with you now with design team work. Oh knows maybe we can do that later. God willing. SO happy to see this beautiful card today. Love the design and the colours are great. This is such a sweet image, really makes me happy for Spring. Take real good care of yourself sweetie. Hugs. Beautiful Card Jennipher, Thanks for following me and I will certainly follow you as well. Love the colors on your card too. Very vibrant!!! That bunny is so sweet! It really pops against the bright BG! Love the flowers!! Gorgeous card Jennipher, I like the image and the wonderful colour, Thank you for visiting my blog. Goes perfectly with that paper. This is one I don't think I have been able to play with. Life is too busy! I have tons of buttons too and it kills me to use them...cause what happens if I need just THAT one for a project! but I have been better lately and have used several for an Easter project I did. This is so pretty! I love the colors and the bunny image is so sweet!